Grommet or Tool-less Clamp installation that fits into any work surface. Counterbalanced spring technology with easy-to-use Allen wrench adjustment. 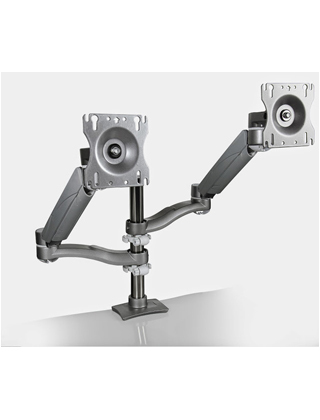 Arms swivel 360° around base allowing for increased display positions. VESA 75mm and 100mm complaint. 2-14lb. max load for single screen, 2-10lb. max load per screen for dual screen. 4-20lb. max. load per each monitor arm. Quick connect monitor screen feature.